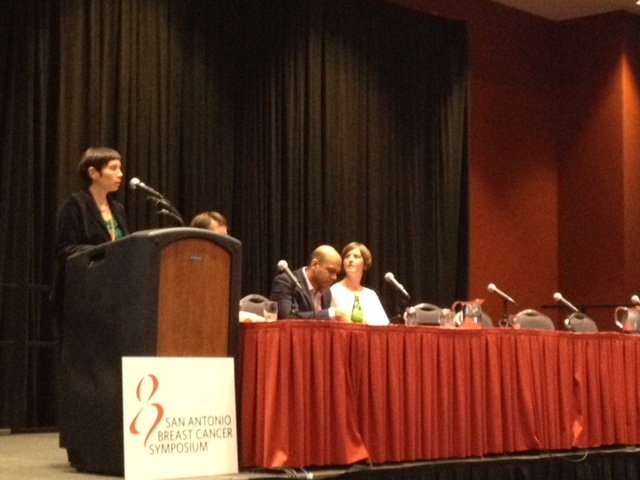 Researchers and physicians from around the globe convened Dec. 8-12 for the 2015 San Antonio Breast Cancer Symposium at the Henry B. Gonzalez Convention Center in San Antonio, Texas. UNC Lineberger researchers presented preliminary findings from studies focused on genomic clues to breast cancer metastasis, the link between obesity and cancer, and on the use of genetic sequencing to find targeted treatments for individual patients. Chuck Perou, PhD, a UNC Lineberger member and the May Goldman Shaw Distinguished Professor of Molecular Oncology, led a panel discussion on precision medicine. CHAPEL HILL – Researchers at the University of North Carolina Lineberger Comprehensive Cancer Center are searching for clues in the DNA of breast cancer cells to understand how and why they metastasize, or spread, in the body. At the 2015 San Antonio Breast Cancer Symposium Dec. 8-12, researchers presented preliminary findings of a study that examined genomic patterns seen in primary and metastatic breast cancer tumors from 14 patients. “In this study, we used genetic mutations as markers to help us understand the evolution of breast cancer metastasis,” said the study’s senior author Chuck Perou, PhD, a UNC Lineberger member and the May Goldman Shaw Distinguished Professor of Molecular Oncology. The findings were presented by the study’s first author, Marni Siegel, a doctoral student in Perou’s lab as well as a medical student at the UNC School of Medicine, in a presentation to researchers, oncologists and others at the Henry B. Gonzalez Convention Center in San Antonio, Texas. Based on patterns seen in groups of cells in study samples of a breast cancer subtype known as basal-like, the researchers believe that the distant tumors may be formed by a large group of cells that break off from the primary site, rather than by a single cell leaving the primary tumor site. Perou said this could have implications for potential therapeutic strategies that are focused on inhibiting metastasis. Also in the study, the researchers looked at the types of the genetic alterations that occurred in both primary tumors and their distant metastases. Focusing on specific mutations that are considered cancer “drivers,” they found that many occur by copy number changes. In a copy number change, a particular gene is amplified or lost, as opposed to altered by a DNA base mutation. And they found that most of those “driver” mutations are shared between the primary and distant tumor metastases. In future studies, Perou said the researchers plan to focus on the actual mutations that are involved in breast cancer metastasis. The study was just one example of work by UNC Lineberger researchers that was shared prominently at the 2015 symposium. Perou also moderated a panel on whether the use of genetics to guide precision medicine approaches is ready for clinical use. Precision medicine is the use of genetic or other molecular biomarkers to find treatments targeted to particular molecular alterations identified in individual patients. The general approach is a “very exciting and promising approach,” Perou said, that’s being implemented through clinical trials at the N.C. Cancer Hospital and other institutions. In opening remarks during the panel, Perou called for institutions to share data and information. “We need to share the data we have because in many cases, we’re looking for very rare events,” he said. “If we pool the data, we’ll get there much faster than not,” he also said. Another UNC Lineberger researcher moderated a panel at the symposium: Lisa Carey, MD, physician-in-chief of the N.C. Cancer Hospital and the Richard and Marilyn Jacobs Preyer Distinguished Professor in Breast Cancer Research. She moderated a panel on the “less is more” approach to breast cancer treatment in medical oncology, surgery and in radiation oncology. One of Dr. Carey’s own studies was highlighted in the presentation. The study, published in the Journal of Clinical Oncology, had found that a certain subtype of women – women with HER2-enriched breast cancer — were highly sensitive to a certain targeted treatment. Dr. Carey said the finding could mean that this group could benefit from less therapy, with fewer side effects, and reduced cost. And in a poster discussion session on translational genomics at the symposium, Juneko Grilley-Olson, MD, a UNC Lineberger member and clinical assistant professor in the UNC School of Medicine, presented preliminary data from a clinical trial at UNC that uses genomic sequencing in metastatic breast cancer patients to inform treatment decisions. There were 131 patients who had sequencing results in the study. And of those patients, the study found that 27 percent of patients’ tumors to-date had an alteration that is an eligibility requirement for a molecularly-targeted therapeutic clinical trial at UNC. Multiple other UNC Lineberger researchers presented preliminary findings at the conference – ranging from data on obesity reversal and breast cancer progression to data from clinical trials testing drugs for breast cancer patients who have central nervous system metastasis. 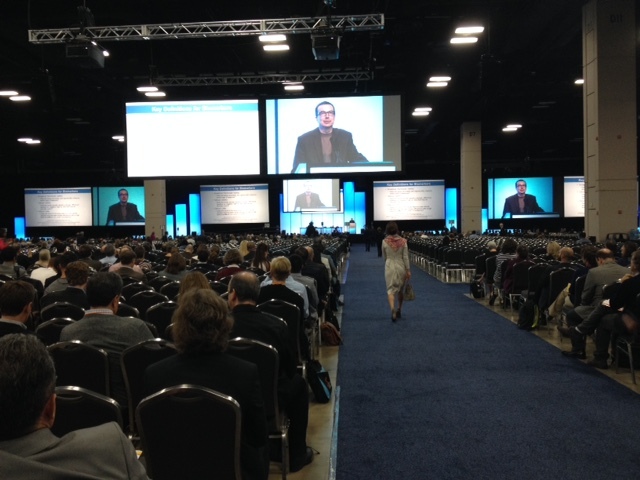 The event drew researchers and physicians from around the globe to San Antonio.